The many applications and benefits of using Coconut oil. Coconut oil…what is it? How do you even begin to use it? I have quite a few friends who swear by using coconut oil on their skin, cooking with it and even eating it by the spoonful. Why is it so great for you? I have been wondering the same thing so I did a little research on coconut oil to educate myself and let you in on it as well. Coconut oil is made of three important acids - lauric acid, capric acid and caprylic acid. When the presences of these acids are in a substance the result is that it makes a product antibacterial, antifungal, antimicrobial, and an antioxidant. That’s a natural way to ward off viruses and bacteria. Coconut oil is also an awesome oil to use on your skin. It is one of the best forms of saturated fat and is about 99 percent comprised of that. This makes it an excellent moisturizer for dry, flakey skin. Some have had success with using it on eczema and psoriasis; some haven’t, the views on that seem to be very differing in the Internet world. Without getting too scientific, just know this, coconut oil is good for you. It will not raise your cholesterol. In fact it actually helps raise your good cholesterol – the HDL (think “h” is for happy) – which as a result lowers the bad cholesterol – the LDL. How do you buy it? 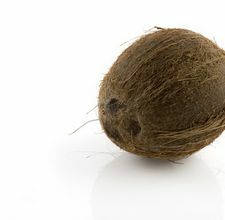 According to Organic Facts.net, the kind of coconut oil you buy depends on how you plan on using it. If you plan on using coconut oil in your cooking or in your hair you should purchase refined coconut oil. If you plan on using it for weight loss, massaging oil, to help aid in good health or for medicinal uses you should buy virgin coconut oil or organic coconut oil. Always buy from a reputable retailer and one that you trust. While you probably won’t find it in your typical super grocery stores you will probably be able to find it at a health store or one that sells only organic and natural foods. It’s usually found in a solid state and will turn into liquid when it’s heated up. And if you’re a cloth diaper user coconut oil is safe to use directly on your cloth diapers without a liner. Supposedly, because it’s anti – well, everything – it’s a great diaper rash cream. A few blogs I researched said that they didn’t have to strip their diapers after using it and while I haven’t tested it out myself, I think I believe them. Will I try my hand at using coconut oil? Yes! I’m going to give it a go. We’ll see what I think so keep your eye out for another post! Elizabeth (aka Bert) Anderson married her college sweetheart in 2005, and started her journey into motherhood in 2008 with the birth of her son. She started blogging in 2009 as a way to keep track of her thoughts on being a first time mom, especially her struggle with postpartum depression, and as a way of reaching out to other moms who are struggling with the same things. This June, Bert had another first in her motherhood travels - a little girl! Even though she's newly a mother of two, Bert maintains that no matter how many children you have you will always be a "first time mom" because there's a first time for everything! Visit her blog, at FTM. Bert is a contributor for She Thinks Media. Coconut oil is the homemade diaper rash cream I make. It works wonders on diaper rashes and if you use it every day it helps prevent them too!! I am lucky because I live on the island of coconuts so I can make my own wipe solution using pure coconut oil mixed with some water, grapefruitseed extract and a little bit of Weleda baby shower gel. Motherhood - Confusing passion for judgement? TWELVE Ways to Green UP in 2012! Official Knickernappies Diaper Hunt Winners List! Today's Featured Fluff Addict is...Maria!